So I’m half way through my Live LAGOM journey … not to sound too cliché but … I don’t know where the time has gone! If you need a little recap on Live LAGOM and my role as Ambassador have a read of my post IKEA, Live LAGOM, My New Sustainable Lifestyle – The Intro but be sure to come back because I want to tell you all about The Progress! We decided that the rooms we were going to focus on for our sustainable living journey were the Living Room, Smith’s Room and our Hallway. We wanted our main focus area to be Energy, we decided we would be mindful of Food Wastage and start Growing our own food. Our shopping trip was a success and we were very happy with our purchases. However as we had just moved into our home in November last year, not only were we beginning our Live LAGOM journey but we were starting our redecorating and renovating story. A result of this meant that our focus room of the hallway was scrapped and some items that were originally bought were returned and swapped for other sustainable living items (IKEA have a very understanding returns policy as long as you have your proof of purchase receipt). Although some of the products we bought may have changed, and we chose not to focus on Live LAGOMing our hallway, our main focus area of Energy (Lighting & Heating) and Grow Your Own didn’t and hasn’t changed, and the little changes we have made in relation to these throughout our home has created a big effect. I’ve broken our spending down for you. Our budget for the project was €650 but we went over and are due to go over some more as we’ve another trip to IKEA planned for the coming weeks. Of course I don’t want to come off as too blasé about spending money, but sometimes you need to spend to save … and as first time home owners to our old new house, we need to spend some money to make our house the home we want. So here it goes – I’ve listed the focus rooms, products bought, their costs (at time of purchasing) and my progress report on each. If you have any Live LAGOM or sustainable living questions for me, please leave a comment below, contact me on one of my social media accounts or send me an email. A definite ‘Still to Buy’ is for the Living Room where funnily enough our hot tank and hot press is (old house etc). We’d like to buy two of the New Box BULLIG Bamboo – 15.00 x 2 = 30.00. They will be used to store bed-clothes & towels in this hot press – Living LAGOM by using the heat and energy that is already in use by airing our clothes in breathable boxes. * all prices are as per time of publishing this post, prices change and that’s life so please only use these figures as a guide and check current prices on the IKEA website before you shop to save disappointment. Smith’s room started off as a blank canvas, and now as I write this it is NEARLY complete, apart from shelves (they were bought but not hung), pictures and a possible mural. It looks gorgeous, is chock-a-block with ‘Live LAGOM’ and I’m looking forward to sharing with you a before and after photograph in my next post – because it has to be finished by then. The focus area’s covered in this room are Energy (Lighting & Heating), Grow Your Own and Recycling. The lighting in Smith’s room is all LED, the LAMPAN Lamp is the perfect size and a playful blue, the Ceiling lamp SOLLEFTEÅ is brilliant – we love everything about it, its shape, its style, the light that comes from it – not one of the most expensive buys but one of the best buys for us because it actually makes the popcorn/orange peel ceiling in his room look good! His new rug helps keep his little feet warm and adds a gorgeous splash of colour to the room which is otherwise neutrally styled colour-wise. The black out blind and curtains are perfect for bright mornings and for keeping out the cold – taking up the curtains wasn’t too much hardship and I’m still deciding what to do with the material that was left over. His room has plants to help clean the air he breathes and plants that will be edible, so he learns the value of plant-life, nature and sustainable living as he grows up. I love his greenhouse, and I love growing stuff. Most plants I’ve put my hand to have survived, unfortunately though only the coriander from his FRÖER Growing Set made it through, and I did what they say you shouldn’t do – I replanted it, luckily though it survived and thrived in on of my SÖTCITRON self watering pots – love them! His PLUGGIS sorting bins sit comfortably on his bookshelf and hold recycled paper and tubs that are potential art supplies. The rechargeable batteries are brilliant – Patrick and I used to use these type of batteries years ago on our world travels but forgot all about them so it was good to reintroduce them. We haven’t used the timer yet but the plan is to use it for his night-light instead of leaving lights on for extended periods of time. Originally we had bought new lighting fixtures for the our living room but after some decorating and woodwork we decided that we’d stick with the original fixtures … now there’s some more sustainable living for you … (it’s crazy how colours change your perception of something). We did however change all the bulbs to LED, which means that all the lighting in our home is LED apart from the front and back porch lights (these need to be updated). The HOPPVALS are great and it was sooo nice to take down the blinds that were on the window when we bought the house. It’s amazing what fresh white blinds can do to a room. These blinds are ideal for our needs now – they were easy to install, fit perfectly over the window (it’s quite a long window), is bright and is easy to keep away from the adventurous little fingers of a 13 month old little boy because with a simple touch the blind raises and falls. The rug is a great addition but I have to admit that with the paintwork and some renovation work, it has been kept off the floor more than on it to save it getting destroyed. We make use of the KOPPLA three-way socket for the T.V. and adapters – it’s very handy with the USB ports for charging phones too. The DRONA and BULLIG storage boxes are great and it’s really satisfying to know that the hot press is being put to good use – it’s also great that it looks neat and tidy at all times too. As well as my own plants that clean the air, like my spider plants – we bought a couple of gorgeous additions in the shape of our Orchid and Boston Fern (which at the moment is kept in the hallway … so maybe the hallway did get Live Lagomed after all!) 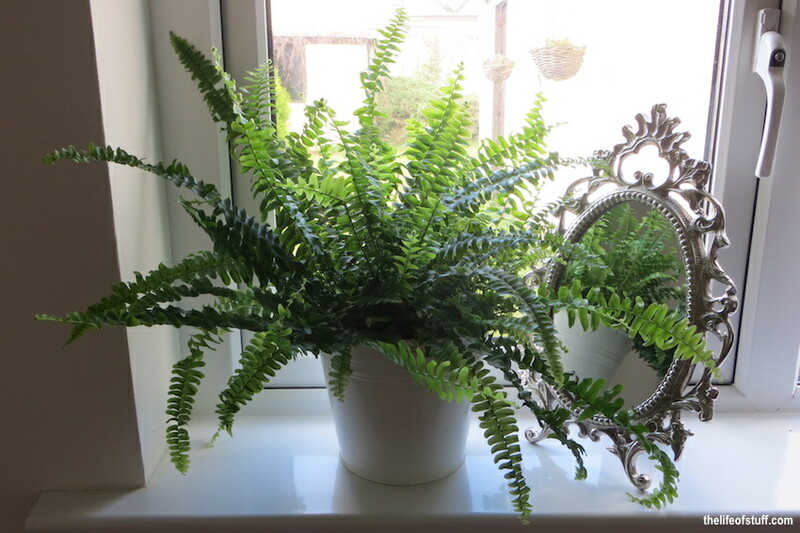 For more on house plants that clean the air have a read of this post … Six House Plants that Clean the Air we Breathe in Our Home. LED bulb E14 200 lumen LEDARE Chandelier clear – 5.00 x 6 = 30.00. We didn’t want to change too much about our kitchen because it’s due to be refurbished. However we did change the lighting to LED, we use our TORKIS basket for hanging out the washing on our new washing line (we never really used a tumble dryer in the past anyway so not a sacrifice in the least), and I’m happily growing my own … pictured below is Parsley, the aforementioned Coriander (which is as you can see is thriving!) and a Tomato Plant. To help with food wastage in our sustainable living, we bought some of the KORKEN glass wear for food stuff that tends to lose its freshness when kept in an open packet, or for the likes of porridge that can often spill or you lose when trying to spoon it out of the pack – no danger of over shopping too as we can see exactly what we have and don’t have in our kitchen cupboard. Bevvy of the Week - Falesco, Le Pòggere Est! Est!! Est!! !